"This creamy, comforting meal takes just moments to assemble and is always a big hit. Great for large family gatherings and to take to pot luck dinners. I'm always asked for the recipe!" Bring a large pot of lightly salted water to a boil. Cook elbow macaroni in the boiling water, stirring occasionally until cooked through but firm to the bite, 8 minutes. Drain and transfer pasta to slow cooker. Add butter to pasta and stir until melted; season with salt and pepper. Sprinkle about 1/2 the Cheddar cheese over pasta and stir. Whisk evaporated milk and eggs together in a bowl until smooth; stir into pasta mixture. Whisk milk and Cheddar cheese soup together in a bowl until smooth; stir into pasta mixture. 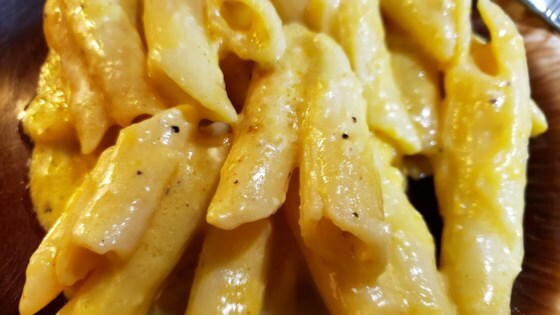 Sprinkle remaining cheese over pasta mixture; garnish with paprika. Some cookers make take less time, watch to be sure edges are not getting to brown at 2 1/2 hours. To bake in conventional oven, pour into a casserole dish and bake at 350 degrees F (177 degrees C) for 45 minutes to 1 hour.